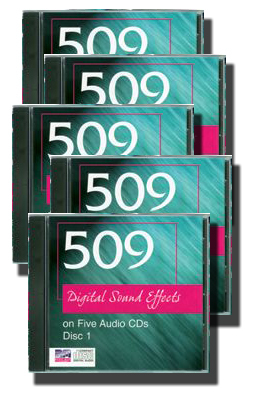 You get the best of both worlds with this set of over 500 sound effects! Remastered from one of the top-selling values in professional sound effects, every sound effect now has its own unique track so you don’t need professional equipment to use it. Whether you’re looking for specific noises or for scene-enhancing background noise for your stage production, you’ll find it here. Besides covering all the standard categories, such as people, machines, military, transportation, nature, and animals, this extensive collection also offers tons more: household, sports, communication, business, construction, and still more! Read more...Best yet, to make this valuable tool as useful as possible for you, we include a 10 page alphabetized printout of all the sounds, including their disc, track, and length. (You can view this list now by clicking on the sample pages button below.) With this one-time investment, you’ll love being able to create your own customized sound effect CD for every single show you do for years to come!